This one's for you, ElNella fans! It's been a year since Janella Salvador and Elmo Magalona's series Born For You aired its pilot episode on ABS-CBN. This got Janella a tad nostalgic over the anniversary of her first project with her love team partner, so she posted a Twitter series of Born For You behind-the-scenes clips and insider secrets. This LOL-worthy blooper reel that she still can't get over—a year after. Being Elmo's makeup artist while shooting in Japan. 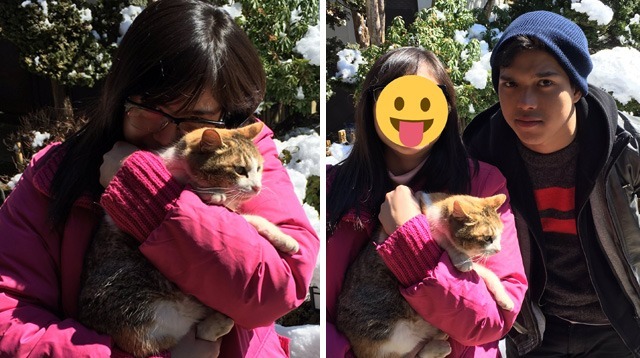 Cutesy pics with a random cat in Japan—in clothes they've worn for over a week. Yay? And lastly, an awkward dance number of ElNella to their teleserye theme song. Cuties! Ending this thread with a very awkward video.